I hope everyone had a relaxing weekend! We had an somewhat easy Sunday - we spent the day cleaning and then later relaxing. LO is still teething so she had a bit of a grumpy morning, but she picked up later in the day after her nap. We decided to try an Indian restaurant that specializes in food from the Kerala region of India, and got two orders of dosas and a vegetarian thali to split. It was delicious! The dosas were huge and crispy, just the way I like them. I liked that this restaurant had a variety of dosas unlike the one that is next to us which only serves one kind. LO enjoyed it too, she had dal with papadam, and a little sampling of the dosas. I think this place might become a frequent spot in our rotation. 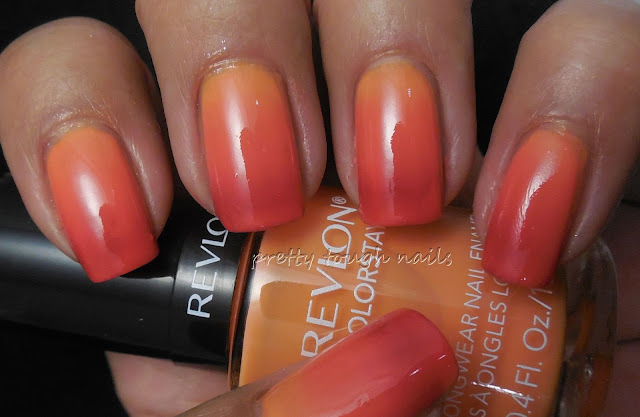 This weekend has been warm and sunny and it put me in the mood to do a summer gradient. 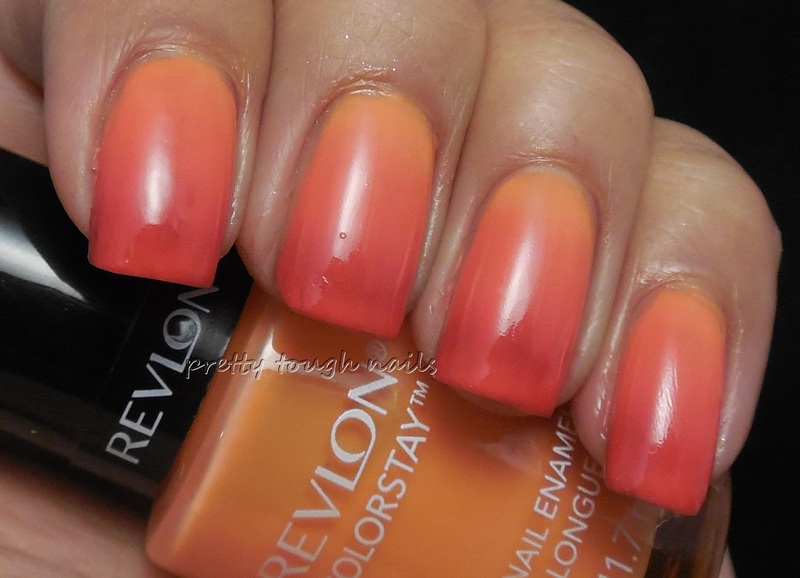 I used a base of Revlon Colorstay Sorbet, a bright orange crelly. 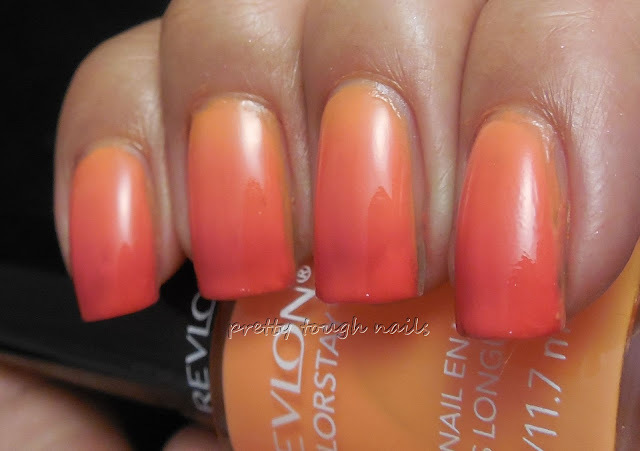 The application was poor though - I used two coats and had lots of streaks. I figured two coats would be enough though since I only needed the area near the base of my nail to be even. 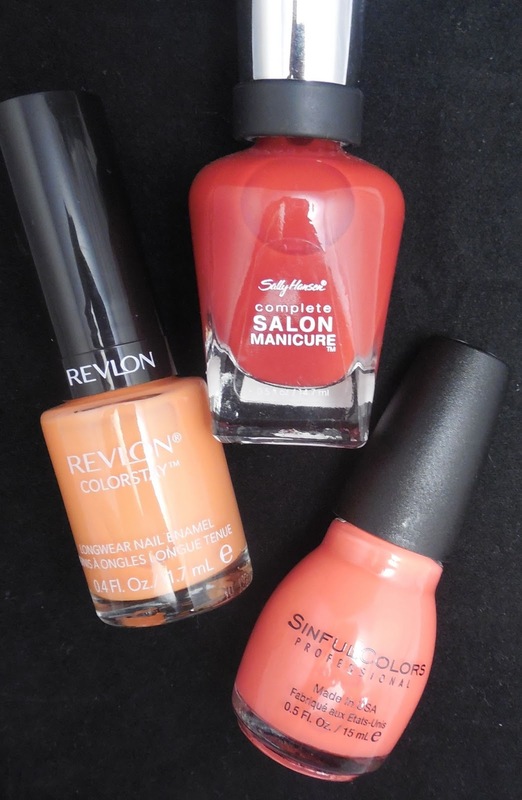 I then sponged on Sinful Colors Sunburnt and Sally Hansen Right Said Fred. 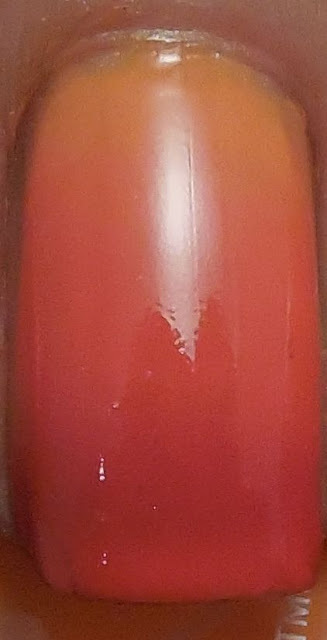 It didn't really work out that well because the red was more jelly than I thought it would be. 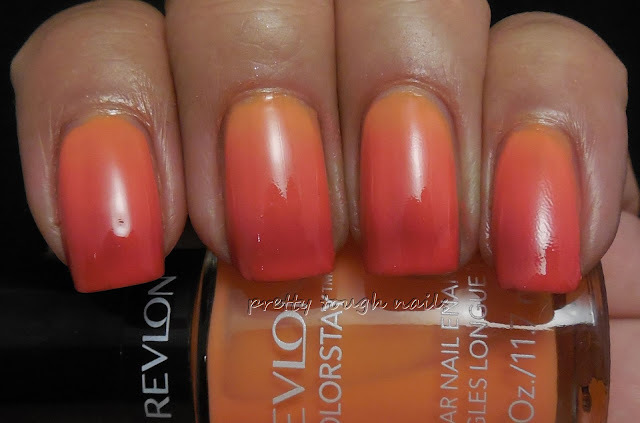 It didn't give as much coverage as I wanted, even after sponging over it a few times. I finished with a layer of topcoat to even out the sponging surface. 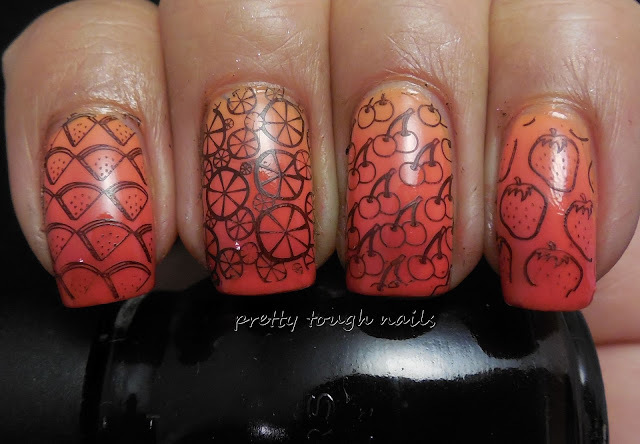 The gradient seems a little bland, so I added some fruit stamps from my Winstonia plates with Sinful Colors black. Might as well make a fruit medley out of it! And yes, the watermelon is upside down - isn't that how everyone eats it anyway? I joke, I joke, I kid, I kid. The stamping sort of hides some of the streaky-ness of the mani, but I fail at cleanup. Oh well. It's still a fun mani to look at. 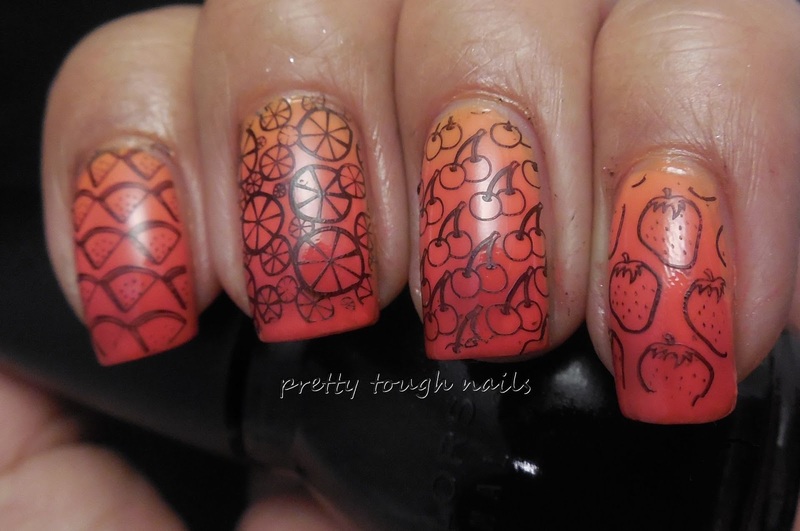 At least my stamping turned out ok although I wish the stamps were big enough to fit my whole nail. 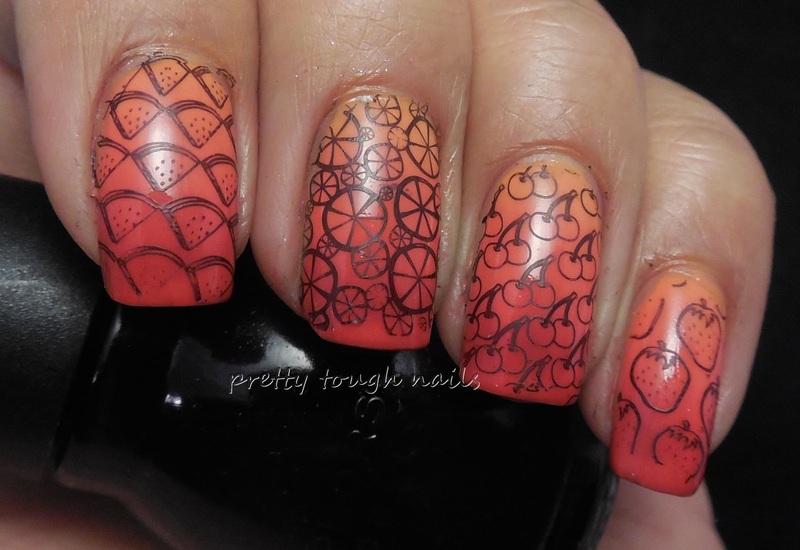 Have you done any stamping lately? All this works is now making me hungry. I'm off to eat a kiwi!